Reinventing a Zulu hut came with a bit of resistance, but the team at camp have come to trust my far out visions of construction techniques. The inspiration to diverge from traditional village ways was to create an inexpensive eco hut that would last longer than the norm. the walls we built with rammed earth. Utilizing our old skate ramp framework we jammed the earth on site into the framework with a 5% cement content making our G5 soil on site as strong as the granite it came from. 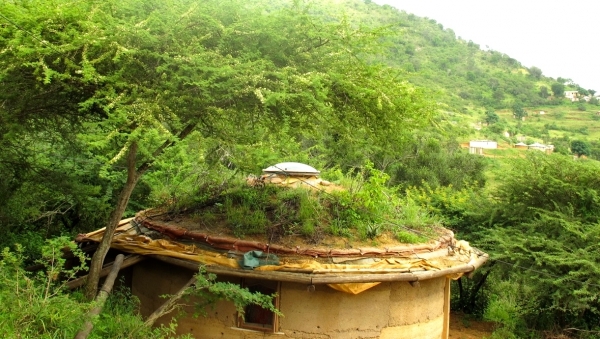 When it came to the roof we opted for a reciprocal frame roof, which could bear the load of our living roof. The total cost of this on suite 6m diameter hut came to approx US $ 2 000 a great saving using recycled doors and fittings where possible. This was our first experimental hut and we look forward to future builds, next up will be a double story rammed earth hut.